Russian investigators have identified the killer of human rights activist Natalia Estemirova, President Dmitry Medvedev has said. During a visit to Germany Mr Medvedev said an "international search" was under way for the suspect. The announcement comes after German Chancellor Angela Merkel called on Russia to "find the truth" about the killing of the Chechen rights worker. 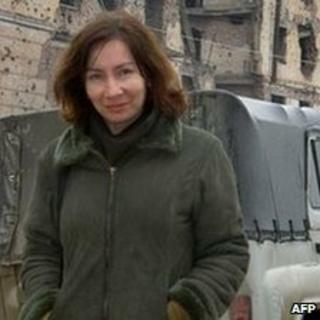 Ms Estemirova's body was found a year ago near the Chechen Capital Grozny. But Mr Medvedev did not identify the suspect - to avoid prejudicing any case against them, he said. The human rights worker, who had documented hundreds of cases of abuse against civilians by government backed militias, had been abducted from her office before her body was found. "It's wrong to say that there is no investigation, the perpetrator of this murder, the killer, has been uncovered and definitely identified," Mr Medvedev said. "There is an international search under way for him, we are now searching for not only the killer but also the person who made the order for the heinous crime to be carried out." Ms Estemirova had worked for the prize-winning campaign group Memorial since the second Chechen War in 1999. On Wednesday her colleagues and family accused the authorities of ignoring vital leads in the investigation. Elena Milashina, a reporter from the Novaya Gazeta newspaper who knew Ms Estemirova, said DNA clues had not been followed up. "Why have no samples been taken from the [local] police officers for comparative study?" Investigators had previously said one of the people responsible for the murder was a rebel fighter who had been killed in a shootout with Russian special forces last autumn. Her colleagues find that scenario far too convenient, the BBC's Rupert Wingfield Hayes in Moscow. They believe her real killers are linked to the pro-Moscow regime of Chechen president Ramzan Kadyrov, and because of that will never be brought to justice, our correspondent says.